Songs, poems and other media including “Wolves in Wolves’ Clothing” and many original works were performed by nearly 20 students to a crowd of more than 50 on Oct. 15 during an open mic session hosted by Student Life. Music and history major Kia Shorter said it’s important for students to have their voices heard. “I’m not a poet, I’m a songwriter,” Shorter said. “Almost every time the country goes through a recession, they decide to take arts and some of the more creative things out of schools. “I guess I feel like if you perform for an open mic and you put your thoughts out there, then it’s not lost. Shorter performed four pieces she wrote herself. “I’ve been writing different media since I was in elementary school,” Shorter said. “I hope that the stuff I shared was effective and got people thinking. Undecided major Sarah Wigham said this was her first time reading her poetry in public. Wigham performed “Paradigm,” a piece selected from a book of her own poems. 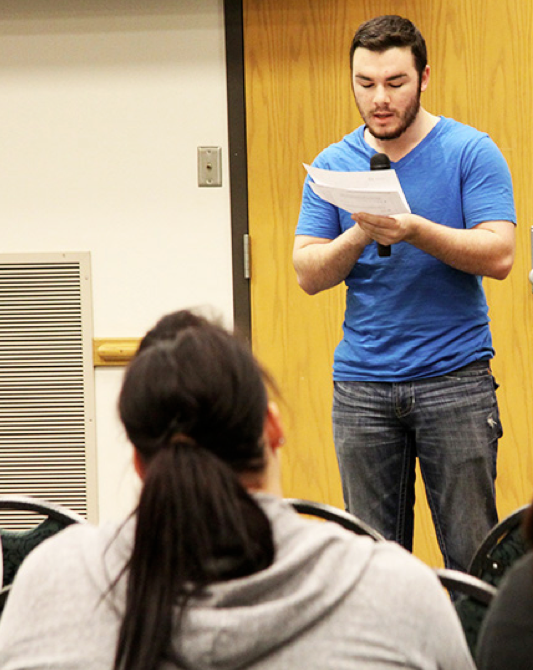 The open mic is part of OCCC’s celebration of Humanities and Diversity month. The next public poetry reading opportunity will be an “International Poetry” event from 11 to noon on Tuesday, Oct. 29 in the WLCC. For more information about the next open mic, call the Student Life office at 405-682-7523.